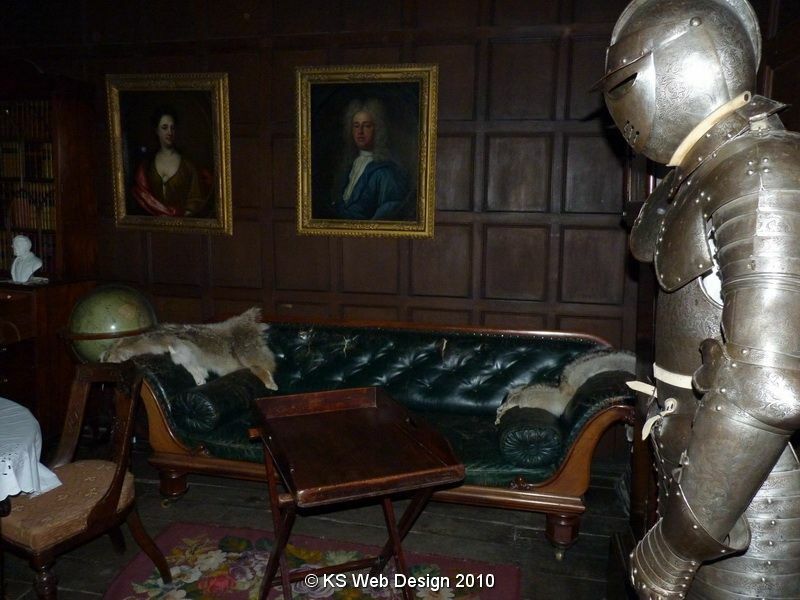 On Friday 16th July we went to a ghost search / hunt evening at Tamworth castle, the price was £32 per person. The evening starts at 8pm and ends at approx 12:30am, I went as I have been a fan of Most Haunted, I even went to one of the live ones a few years ago in York. Here are my personal thoughts on this very interesting evening. (sorry for being a long article but did want to go into as much detail as possible about the evening. There was a group of four of us that went, the total amount of people there was 19, on arrival we was all in the great hall with a talk about the way the evening was going to go and being introduced to the mediums and guides for the evening. We didn’t realise that we could take our own cameras / camcorders, luckily I had left my camera in the car, so I went and got my camera out of the car & also one other person in our group had got his compact camera on him. After the talk in the main hall we all was guided around the castle, being told about the history of the castle and told about some of the paranormal experiences that people have had around the castle, once the tour was over we all was in the great hall again, then we was split up into three groups, in our group there was the four of us and couple. We was given two different types of equipment a EMF meter and a laser temperature sensor that we could use. Our first part was to go to the one side of the castle, being guided by the same lady that had shown us around the whole castle, we went to different room and even a very small corridor that was very claustrophobic. We was mainly in two different rooms, the lady was telling us about thing that had gone on in the castle, now because was dark was a bit spooky especially where the suit of amour is in one room, we moved on to the one room that is set out like a nursery now again this is spooky and unnerving in the dark especially the pram, as walking into one of the rooms I did go abit light headed (not sure of the room but has got a old bathroom in, but other than that we didn’t experience anything else really. We then had a tea and coffee break in the cafe /shop, both me and one of our group brought some small wind up torches from the gift shop, and to be honest they did come in useful, so if you go to this kind of evening it is a good idea to bring a torch, as parts are very dark. After the tea break we then moved to the town hall, which is just by the castle, this time we was with two mediums, first we went down into the cellar in the town hall, we all sat down and the mediums started talking about what they could sense, the one said she could feel the presence of either a man or boy under the ground, the boy she could sense was playing with some kind of wooden ball, like a marble, they called out if anyone was there, someone said they heard a noise, though I didn’t hear anything, because not that much happening in the cellar, we moved up to the meeting room. In the meeting room we was being told they could sense someone in the room, maybe with a bell or something similar, we than all held hands in circle, again the mediums could sense someone with us, at this point the one medium started swaying backward and forward, the other medium got in front of her, the medium that was swaying was saying no, as the other medium asked questions and the lady swaying was saying different things in a deeper voice than her own, this went on for a few minutes, then the lady that was swaying and seemed to be under the influence of someone. She then came around and had to go out of the room as she seemed shaken. Now to be honest and this is just my personal opinion I didn’t really believe that she was being controlled by someone, two other people of our group also thought the same, again this is my opinion but really you would need to be their to make up your own mind. After coming back from the town hall, we then went with the other medium to the other side of the Castle, We went into the one bedroom that is known as the haunted bedroom, we all sat to the one side of the room with the display of the bedroom in front of us, me and my friend has sat on what could be described as a little puffett / bench. The medium was telling us about different things that had gone on in this room, I had kept checking the temperature with the sensor I had but no change around the room, then my friend just moved her hand and touched me the next thing we knew the bench we was sitting on collapsed, she jumped up screaming, so did everyone else, everyone was a bit shaken, now my friend that was sitting by me had the EMF meter and after she jumped up we did all hear it drop to the floor. Both my self and the medium checked out the bench that had collapsed and it did just look like it had broke, while we was looking at that we tried to find the EMF Meter, it wasn’t by the bench where we was sitting, both me and the other person with the torch was looking for it all around the room, but couldn’t see it anywhere, we did this for approx 5mins. 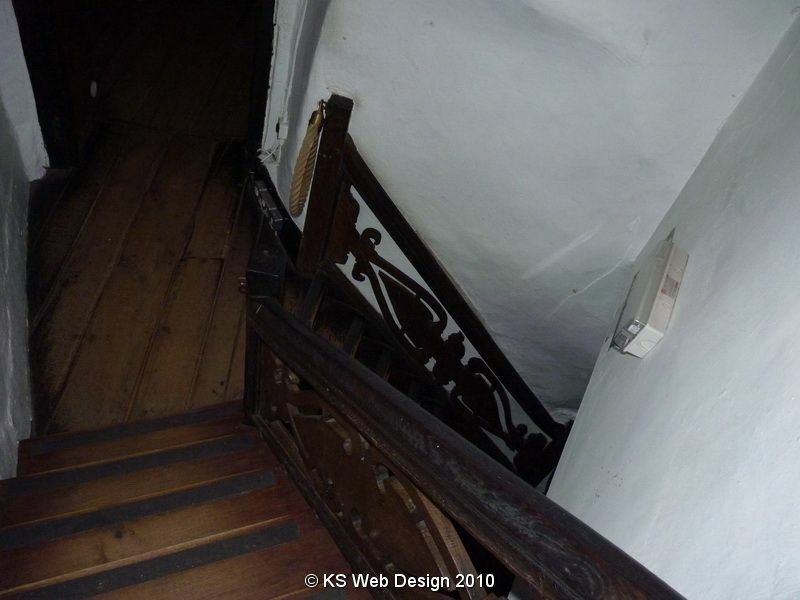 While searching for the EMF meter, I was by the door (as in the photo below), as I moved the floor did creak under my foot, but the I heard a few creaks on the wooden stairs as if someone was walking up the stairs, I shone my torch into the stairwell, expecting to see someone coming up as thinking some had heard the screams and was coming up to check, but nothing or no one there. at that same time, my hole body shivered and i did feel very nervous I stayed still for a few moments and looked again in the stairs and used the temperature sensor, but no change in temperature, I then had to move to the other side of the bedroom very quickly as did feel very nervous, and to be honest this really did freak me out, as the noise wasn’t from anyone else in our group as they were a few metres away behind me, so they were further away from the door. So I have no explanation about this as I am sure the creaks where coming from the stairs and no where else. At this point we still couldn’t find the EMF meter, the medium was saying that she could feel someone basically having a good laugh, so we decided to move to another room, as we was going out of the room, one of our group put in hand in his front full length jacket pocket and pulled out the EMF Meter, He said he hadn’t put it there and non of us had put it in his pocket, now he was the other one with the torch and mainly me and him had been looking for the EMF meter, so we wasn’t sure what had happened. Now this person doesn’t really believe in this kind of thing, but he was really shocked and freaked out that the EMF meter that we had both been looking for and that we all heard drop on the floor was in his pocket, so again with this part we have no explanation to how it got in his pocket. We then went upto the guard room, we all sat on the benches. the medium was saying she could feel a presence, now after a few minutes of being in this room I did feel really tearful for no reason, I could even feel myself starting to well up at some points, I hadn’t said anything about this and the medium was saying that she could feel a presence of someone that was sorrowful, so that is weird that i felt like that and she was saying about this person, she couldn’t also go toward the one end of the room, now both me and another person both after we had left the room had said that we thought we could see the outline of someone sitting at that same end of the room. It was now around 12:15am, so went back to the main hall, and the two mediums that we was with in the town hall was going to let the spirits move a glass on a table they had their figures on the glass and as they was asking a presence to move the glass it was moving, at one point they asked if anyone would like to have a go, so my friend got up, but the glass didn’t move with her. Now again my personal opinion is that the glass moving wasn’t believable, but this is just my personal opinion. I have uploaded most of the photos that I had taken that evening these are unedited so not the best quality as some were taken without the flash in dark environments, I have only re-sized them for upload, there are a few orbs on some of the photos, will leave it up to you to decide if they are just dust or something else, click the link below to see the photos. Most Haunted at Tamworth Castle. After going to the ghost search, I found the episode of most haunted from 2003 and their visit to Tamworth Castle, I watched this 2 day after going and was a very interesting watch, as in the programme Derek Acorah says could sense a woman just a few steps down on the stairs and she goes up and down these stairs and stops just at the top of the stairs (now these are the stairs that I got freaked out with) Derek Acorah had got the Name Editha, There was also was also a door that slammed shut at the bottom of the same stairs and when they was doing a vigil the camera mounted at the bottom of the stairs had moved while they had heard creaks on the stairs. The programme finished as when they were in the same haunted bedroom they called out and the fire alarm went off, and there was no reason for it. I have only said the parts of the programme that are could be relevant to our visit. Now I had seen this episode when broadcast in 2003, but I have been round the castle before, so there is no way I would have remembered this for me to think about that same staircase, so this did make me think about what I had heard, but again its down to each person to believe what they want. All I can say from my personal experience this was very similar to what I heard and thought.